“Crazy, Unbelievably YUMMY”, Vegan Rice Krispy Treats!!! My kids were at a fun summer party at a friends house yesterday, and they were serving Rice Krispy treats. I was not there, but my niece, son, & daughter, all turned down this delicious dessert. I was so proud of them for staying strong, while on their own! So I decided to run out and buy the ingredients for Vegan Rice Krispy Treats. Unfortunately, our local grocery store did not have Vegan marshmallows, so I had to find another way to create our treats. 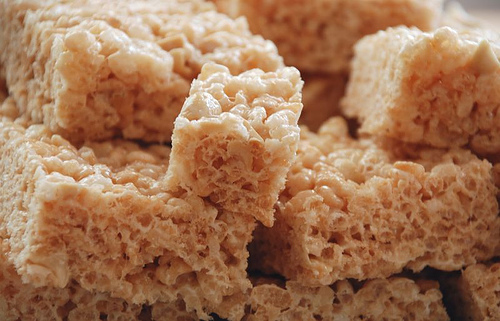 This recipe makes the yummiest Rice Krispy Treats EVER, and they only took minutes to prepare!!!!! I’m not going to lie and say these treats are healthy or low in sugar! But they are a “treat”, so as long as you are not making these for your kids every day, this “Vegan Mom” says….. ENJOY!!! Heat syrup in saucepan over medium heat & add sugar. Stir continuously for a few minutes, when it boils, add margarine, then add vanilla, still stirring. Pour Rice Krispys into a large bowl, and then slowly pour liquid over them. Stir until all ingredients are completely mixed. Form a rectangle on wax paper about an inch thick. Allow Rice Krispys to cool and harden for about an hour, then cut into squares.